I’m regularly on the road talking to surveyors about how their businesses can remove traditional methods of working and what can be done to alleviate the constraint of some out moded practices, improve operational efficiencies and reduce risk. It is encouraging to see a growing number of surveying firms now working with us who are not only re-engineering their businesses with our technology but are telling us what they need next to improve their service offering in future, which is a refreshing clarion call across the profession. I only hope their lender clients are getting full exposure to this desire to allow technology to deliver over and above what has been a muted level of expectation in recent years. The surveying community is revelling in what is now available to them. Change has been driven by better data being available to make better valuation and underwriting decisions. There have been improvements in technology through mobile devices in order to communicate in real time the progress of a particular survey. And there is now better risk analytics tools to help categorise and articulate risk exposure. Very soon new build property will have a much more transparent and visual data set made available to surveyors and lenders, and perhaps builders and developers. This data can contribute to all concerned through the ability of technology to bring data sources together and frame data outputs in a real time meaningful way. The timing of such an innovation couldn’t be sweeter given the clamour to build more homes. 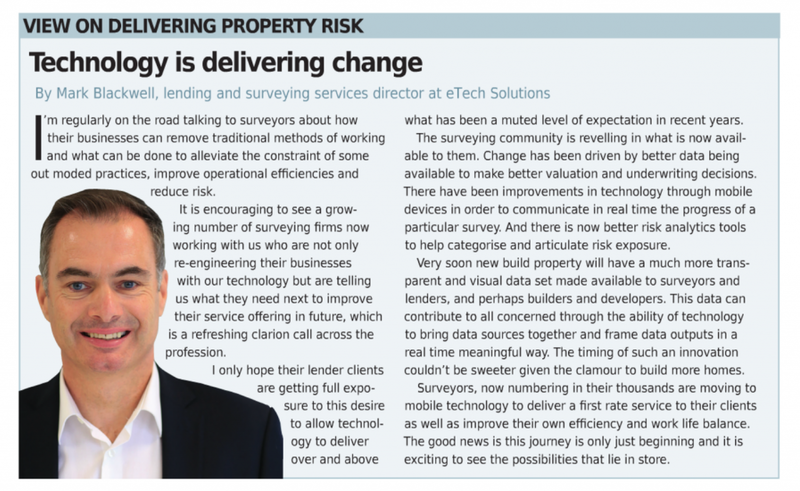 Surveyors, now numbering in their thousands are moving to mobile technology to deliver a first rate service to their clients as well as improve their own efficiency and work life balance. The good news is this journey is only just beginning and it is exciting to see the possibilities that lie in store.